I knew I wanted to be a pro cyclist when: I won my first race. I was 14 years old and I remember it was an MTB race. Greatest racing memory: Tour of China. It was my first international win, taken in big race, with 2.1 UCI status. Race I dream of winning: Paris-Roubaix. It suits me since it’s held in hard, cobbled terrain. Kamil Gradek is considered one of the strongest time trialists on the Polish racing scene. His TT skills helped him win the Ronde van Midden Nederland and claim third overall at 2018 Szlakiem Walk Majora Hubala. The former U23 Polish time trial champion also copes well with tough, cobblestone terrain, having placed in the top-10 at several Belgian races. 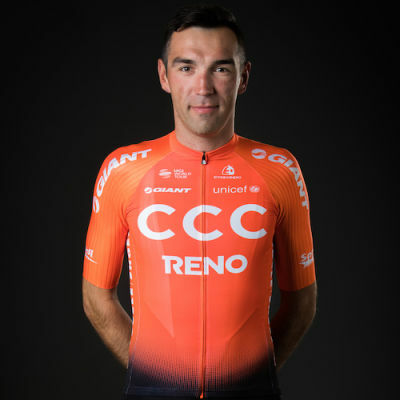 One of the tallest riders in the peloton, Gradik has earned respect from his teammates for pulling hard at the head of the bunch and working for the team leader.